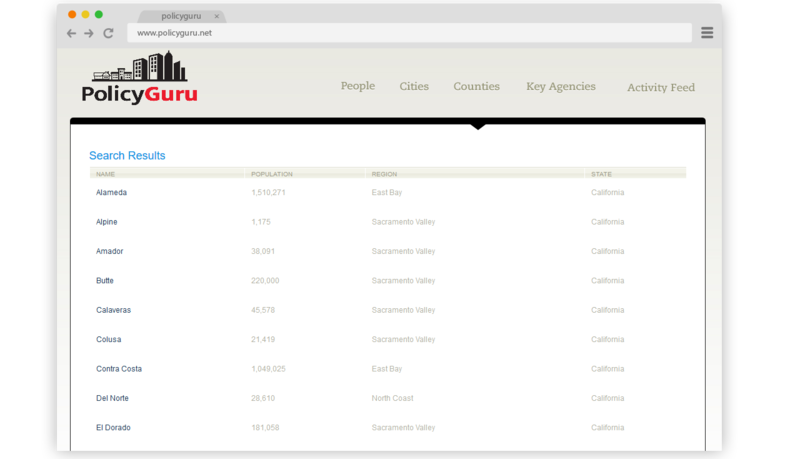 PolicyGuru is a searchable database of local government across California. It's ideal for advocacy and campaign work. PolicyGuru Enterprise Is an essential tool for organizations involved with campaigns, coalition-building, or advocacy at the local level. 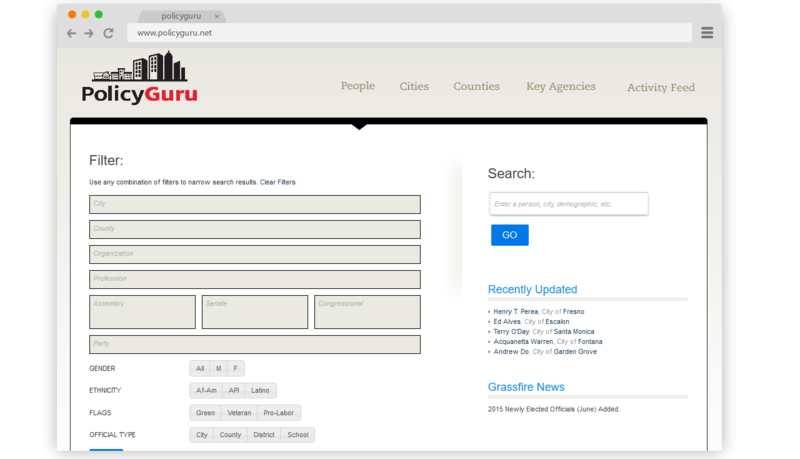 We work to keep our database of local government officials and topline city information up to date on a daily basis. Find representatives who support your issues by viewing their voting history. We provide in-depth, searchable and indexed profiles of elected officials, including political party designations, professions and key affiliations. We've created the fastest and most convenient and up to date cloud technology to help you easily and more efficiently research city and county governments. Hand Written Biographies of more than 3,000 current elected officials. Past Performance at the ballot box, as well as future election dates. 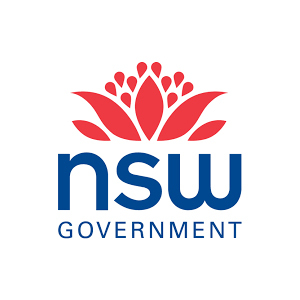 Public and Private contact information, as well as social media links. Looking for a particular city or cities? 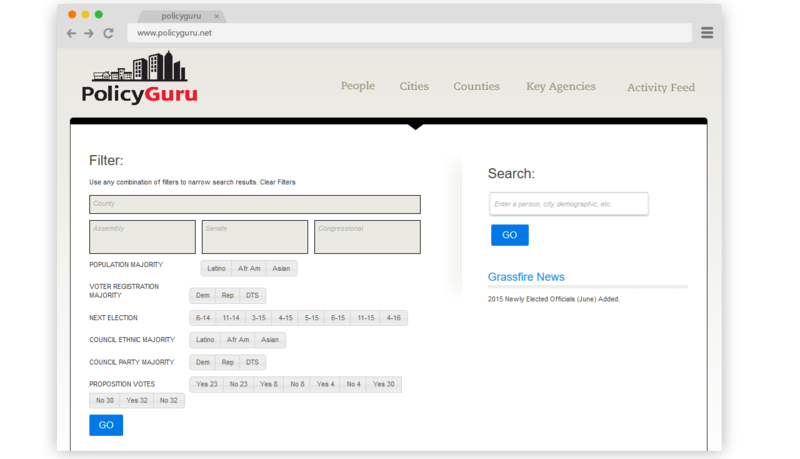 Type the name of one or more cities in the first field of the main search page. Please note, to prevent misspellings from throwing off results, the tool will suggest the city name as you type, you must then select it (rather than just hitting return). Looking for Republicans in AD 60? Democrats who are also attorneys in Orange County? We’ve got all that. Use the filters on the main search page and hit ‘Go’ when you’re ready. 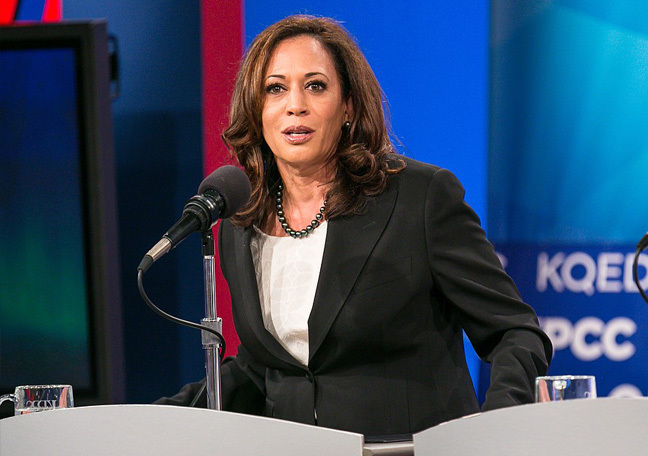 The options demonstrated at left will yield Latino Democrats in LA County. Please watch for the ‘City/County’ tab just above the Go button. 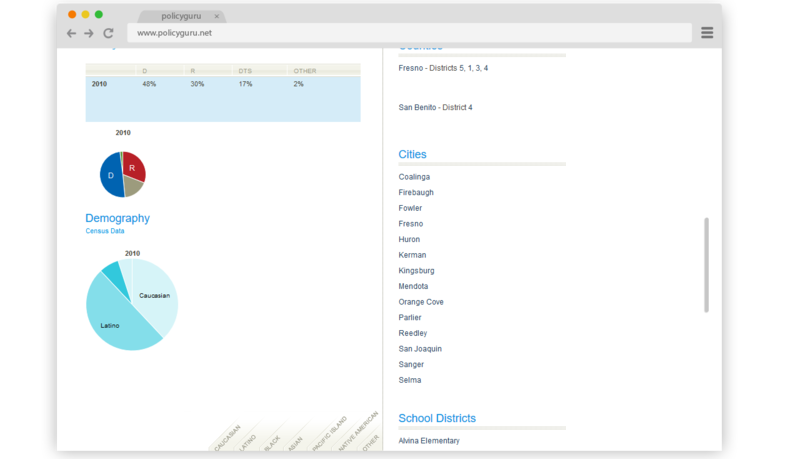 By default, you will get both city and county officials, but you can select one or the other. 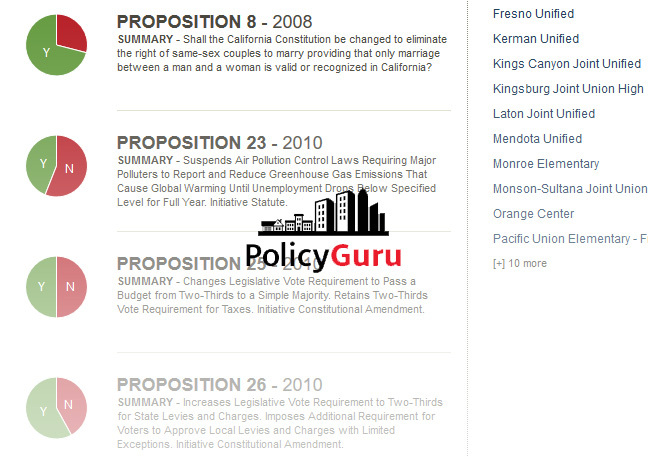 PolicyGuru enhances advocacy and campaign work at the local level across California. 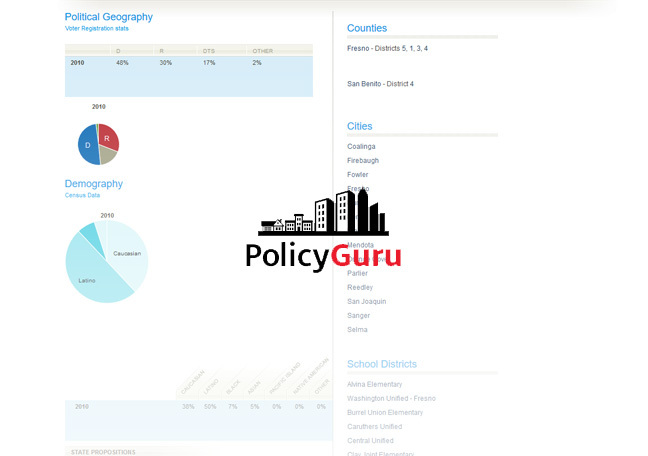 We strive to make PolicyGuru the most powerful software and database of local city, county and school board information ever available in California. ID prospective candidates for higher office or for regulatory appointments. Identify ‘swing cities’ to change council dynamics and/or promote candidates of any persuasion. Build coalitions and working groups by profession, ideology, ethnicity, gender or any combination of these and other tools. 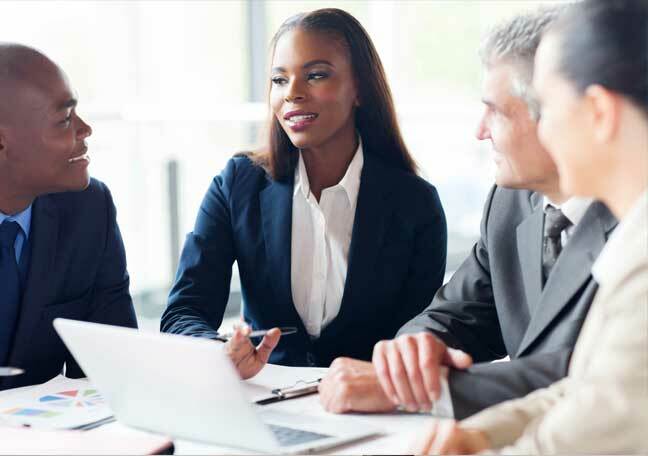 Identify prospective candidates for higher office or for regulatory appointments. Identify ‘swing cities’ to change council dynamics and/or promote candidates of any persuasion. Know who the likely swing votes are based on how they’ve voted in the past. Combine the powerful database within PolicyGuru with fastAdvocate, our mobile first grassroots lobbying platform that can coordinate grassroots lobbying campaigns via mobile apps, email, fax, phone calls, and postal mail. Visit the fastAdvocate website for more information on it's capabilities. Results from 2016 elections and historical data from previous elections. Observe trends and be in the know when doing coaltion building for your advocacy work. 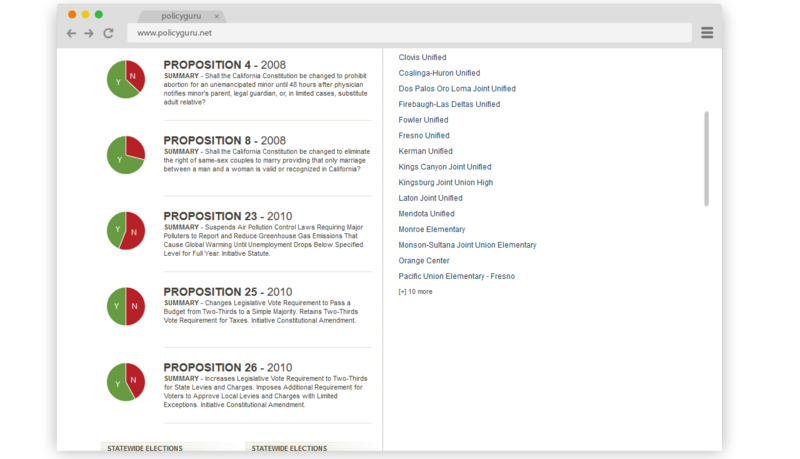 Capitol Enquiry has been a leader in offering data related products for use in California politics since 1973. Los Angeles Times Capitol Enquiry products are found in the hands of our customers, on college campuses used to educate college students on advocacy work, and even show up in Hollywood movies. Providing Advocacy Products Since 1973. The PolicyGuru platform makes it simple to pinpoint who to contact for the issues you care about. 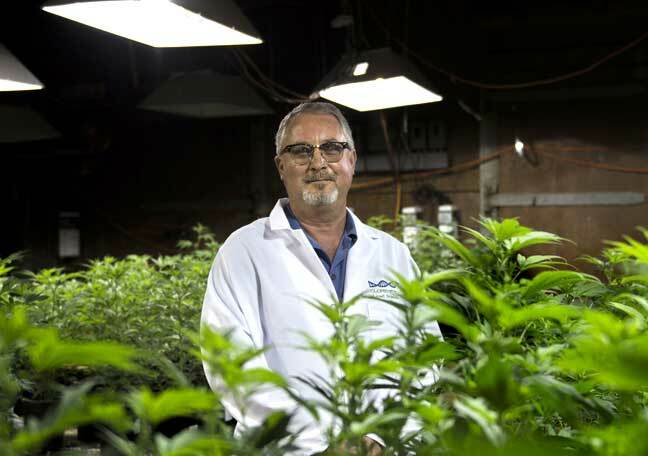 Our features make the process faster and more accurate by constantly by updating our information. We keep on top of changes so you can do focus on making change happen.